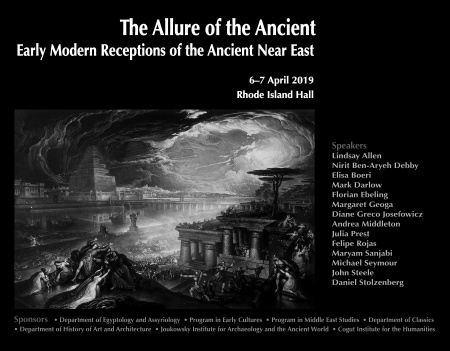 The conference “The Allure of the Ancient: Early Modern Receptions of the Ancient Near East,” will be held at Brown University, April 6-7, 2019. The conference will bring together a diverse range of scholars interested in the reception, use, and misuse of ancient Egypt, Babylonia, Assyria, and Persia in early modern art, literature, scholarship, and politics. The conference seeks to go beyond a purely Eurocentric study of reception and will also explore local reception of the Ancient Near East and its reception in the Americas. The conference is organized by John Steele, Margaret Geoga, and the Department of Egyptology and Assyriology. We also thank our co-sponsors: the Program in Early Cultures, the Program in Middle East Studies, the Department of Classics, the Department of History of Art and Architecture, the Joukowsky Institute for Archaeology and the Ancient World, and the Cogut Institute for the Humanities. or John Steele ([email protected]) with any questions.